The items allegedly found in the possession of Anna Mackenzie, Graham Jacob, and Christopher Magoon. 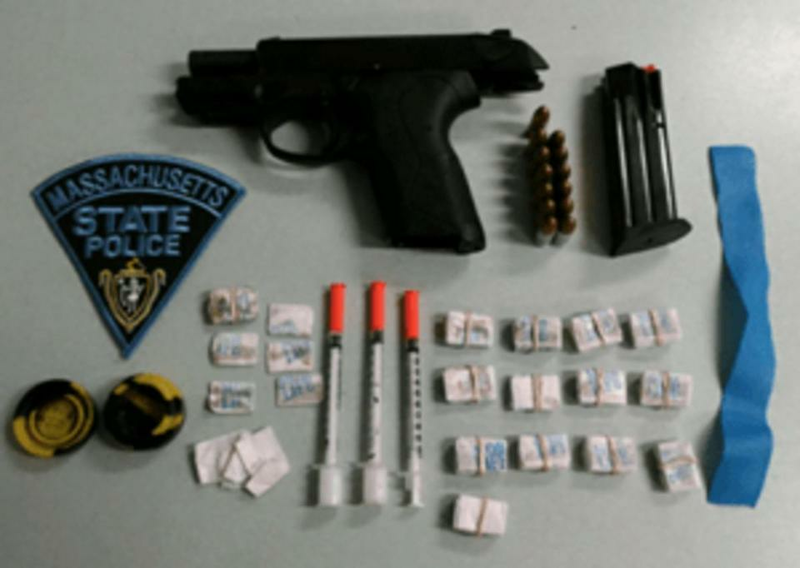 Three Vermont residents were arrested early Tuesday morning in Bernardston after a gun and 148 bags of heroin were found in the car they were in, Massachusetts State Police said. About 4:50 a.m., Trooper Scott Boutell stopped a black Toyota Celica for committing several motor vehicle violations on Interstate 91 North, State Police said in a statement. Boutell determined the car’s operator, Anna Mackenzie, 32, of Barre, Vt., was driving with a restricted license. She was immediately placed under arrest. Boutell searched Mackenzie’s car and found an unloaded 9mm black Beretta firearm, one magazine containing 13 rounds of 9mm ammunition, and approximately 148 small bags of heroin, State Police said. Neither Mackenzie nor her two passengers — Graham Jacob and Christopher Magoon, both 26 and also from Barre, Vt. — possessed a license to carry a firearm in Massachusetts. Boutell also found 15 bags of heroin in both Jacob and Magoon’s possession, State Police said. All three suspects were taken to the barracks for booking and were charged with possession of a Class A drug and conspiracy to violate a drug law. They also face various firearm and motor vehicle violation charges. They were arraigned Wednesday in Greenfield District Court. Mackenzie and Jacob were released on personal recognizance, and Magoon was released on bail, the Greenfield District Court clerk’s office said. The three suspects are scheduled to return to court Oct. 31.